Classic 60s-style Tele with extra sounds from the four-way selector and S-1 switch: what's not to like? Smooth, high-end sounds. Clever pickup selection provides wide array of very useable tones. Bridge was brass, not chrome, as specified. Die-hard traditionalists are well served by the vintage-correct models, and even if Fender has mucked up the recipes a bit for the Classic Player Bajo '60s Telecaster, it's still imbued with Fender DNA. Designed by the Custom Shop's top guitar makers, but made in Mexico, there's an alder body hidden by an opaque polyester finish, and a gloss untinted maple neck with rosewood 'board. 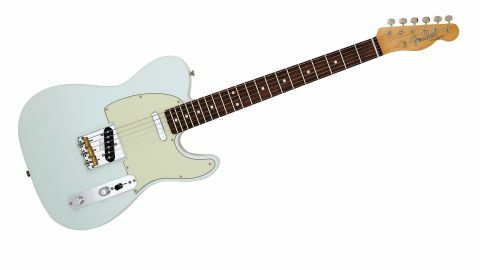 The Baja, in 60s style, has no skunk stripe, and there's a vintage-style truss rod adjustment at the body end. "It's the neat switching that makes this very classic-looking Tele act a little differently"
In its original, more 50s-style format, the Baja is well loved: not surprisingly, this new '60s Baja - like the original, designed by Chris Fleming - had numerous of our staff requesting it as soon as it was announced, not least in this rather fetching and oh-so-Jack White faded Sonic Blue with eight-screw three-ply 'mint green' scratchplate. Yup, it's a looker and has two other colour options. Its 60s credentials are seemingly just the slab rosewood 'board with its clay dot inlays, as although Fender's spec sheet tells us to expect chromed steel saddles, here we have a 50s-style Tele bridge plate with three brass saddles. It's clearly aimed at the early 60s, too, as the tuners are split-post types not the latter-60s 'F' logo style, although the weight - 3.8 kg/8.39 lbs - certainly suggests a later 60s vibe. It's the neat switching, however, that makes this very classic-looking Tele act a little differently. All the standard Tele pickup selections - bridge, bridge and middle (in parallel) and neck - are in place, but it's a four-way switch, as opposed to the standard three-way; the additional selection provides us with both pickups in series for a bigger, louder and more humbucker-like 'secret' sound. The volume control has the S1 push switch in the top of the control knob: pushed down, the parallel and series-combined pickup selections are out-of- phase, giving three additional sounds over the standard Tele. "The extra fourth sound on the pickup selector is a great 'secret weapon'"
The Baja sticks relatively close, of course, to the classic 60s Tele recipe. The rosewood 'board and alder body just seem to give that lovely smoothness to the high end that will make it less ear-wearing, especially if you're swapping over from an older-style humbucking Gibson. The standard mix is typically classic, wider than a Strat's but still nicely textured; the neck pickup here sounds a little fuller than some older readers or vintage guitar owners will remember. The extra fourth sound on the pickup selector is a great 'secret weapon': much more humbucking - and seemingly the only combination that is partially, at least, hum- cancelling. It's louder, too, which combines to drive a lightly cranked valve amp really nicely. Kick in a solo boost and, again, we move closer to Gibson. Switch back to clean, though, and it remains a very usable jazzier tone with more definition and poke than the neck pickup on its own. Depressing the S-1 switch gives us two extra out-of-phase tones: in the standard 'middle' position with the pickups in parallel, the effect is less noticeable, a sort of slightly honkier but also clearer version of the in-phase sound. It's nice to add a little definition, perhaps, to rhythm parts. In the extra fourth position, with the pickups in series, the effect is more typically out-of-phase, with that honky filtered nose that never sounds quite 'right'. But again, it has its uses, either to produce some really snarling, gritty overdriven riffs and leads or played clean - it's an essential vintage funk sound.